"A Calm," Dominic Serres, 1789, Royal Collection Trust. 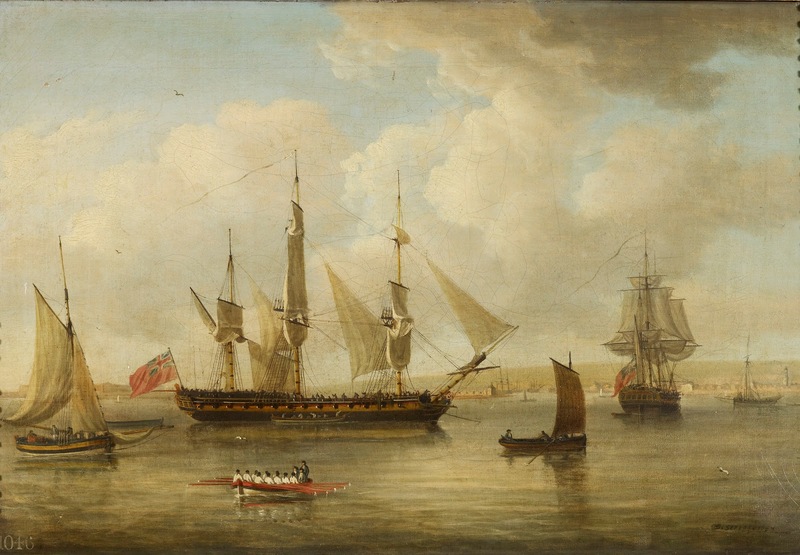 At the center of this piece is a frigate with limp sails. A red ensign flaps from her stern, and small boats sail around her, so clearly there is a breeze, but she has no interest in taking advantage of it. N.A.M. 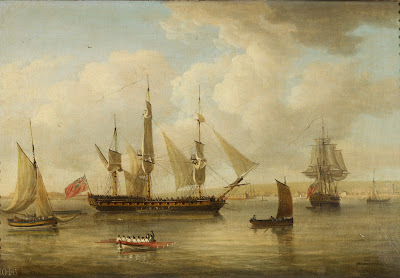 Rogers, in his scholarly and very readable "The Wooden World," demonstrates that naval vessels of the eighteenth century spent most of their time in port. This was a fairly leisurely time, during which watches were foregone in favor of a standard working day. Such seems to be the case here, where the calm of a friendly port gives Serres' painting a serene feel to it. Aboard the single masted sloop to the left are some characters with little detail. We can say that one of them wears a blue jacket, but that's the best I can do. Aboard the red barge, oarsmen lay on their oars. They wear white shirts with black barge caps. It appears that black neckcloths are tied about their necks, but this might be the rarely seen queue. I had fully expected to find a lot more queues when I began this project, but they are almost entirely absent. Sailors generally wear their hair in a bob style or about shoulder length. At the stern of the barge (behind the two officers) stands a coxswain with a black hat and blue jacket.